Ireland's newest commercial TV station has launched, becoming the new home to a variety of ITV soaps and dramas in the Republic of Ireland. Starting at 7:25pm on the 1st January 2015 with a five minute introduction, UTV Ireland took a place on all Irish digital TV platforms. 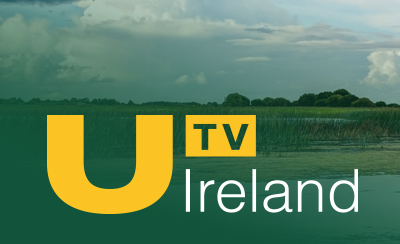 On cable, UTV Ireland took over UTV Northern Ireland's slot. Terrestrial viewers with Saorview will need to retune to watch UTV Ireland if they haven't done so already. The new channel's schedule includes Pat Kenny presenting a special opening night feature "Out with the Old, in with the U", James Nesbitt's Ireland and new Irish news programme Ireland Live from 5th January at 6:30 and 10pm. ITV staples Lorraine, The Jeremy Kyle Show, Judge Rinder and Loose Women fill the daytime schedule, simulcast with the UK's ITV/STV/UTV Channel 3 network, with Coronation Street, Emmerdale, The Cube and the BBC's Graham Norton Show among the evening fixtures on the channel. *the Saorview version is currently standard definition only. Catch-up will be possible in the Irish Republic via the free-of-charge UTV Player. It will allow viewers to watch a wide range of programmes, from soaps to news, for a minimum of 24 hours after broadcast, although UTV Ireland says that "many programmes will remain available for up to 30 days." Apps for smartphones and tablets are now available to download from the Apple App Store and Google Play for Android. It's UTV's biggest expansion into the Republic of Ireland to date. UTV first began as "Ulster Television" in 1959 providing an independent television service in Northern Ireland. The media company diversified into radio and currently operates a number of radio stations across the Island of Ireland, as well as numerous UK stations including talkSPORT and has interests in DAB digital radio multiplexes serving Stoke, Swansea and West Yorkshire. UTV Ireland is only free-to-air on Saorview, the Irish terrestrial TV service. It is currently only available in standard definition on Saorview. How do I get UTV Ireland on Saorview? Viewers in Ireland with access to the Irish digital terrestrial television service should visit the Saorview website, which has instructions on adding UTV Ireland. Can I get UTV Ireland in HD? Yes, if you are a Sky, UPC or eVision subscriber in the Republic of Ireland. The HD version is not available free-to-air. What’s happening to UTV on UPC cable in Ireland? In the Irish Republic, UTV Ireland replaces the original UTV service from Belfast. Can I get UTV Ireland in Northern Ireland? Or elsewhere in the UK? Only as a terrestrial overspill signal from Saorview, in parts of Northern Ireland and the far western tips of Wales. Can I manually tune in UTV Ireland on Sky or Freesat? No (well you could, but you wouldn’t be able to watch it). The only viewers who can watch it are Sky subscribers in the Irish Republic who will already have it on channel 116. The only UTV available outside of the Irish Republic is UTV Northern Ireland. I can manually tune to get UTV Northern Ireland on satellite, why not UTV Ireland? UTV Northern Ireland is free-to-air thanks to being part of the UK’s Channel 3 network and being an affiliate with ITV. UTV Ireland operates outside of this framework and cannot rebroadcast ITV programmes back into the UK, therefore it is encrypted and not available via Sky Other Channels (manual tuning). Is UTV Ireland available on Saorsat? Will UTV Ireland be the same as UTV Northern Ireland? No. UTV Northern Ireland is an affiliate of ITV through the UK’s Channel 3 network. UTV Northern Ireland therefore has full access to ITV News and Sport, which UTV Ireland will not have. However, numerous ITV programmes produced by ITV Studios shown on UTV Northern Ireland will be simulcast on UTV Ireland south of the border. Will all ITV programmes be available on UTV Ireland? No. UTV Ireland is not part of the UK’s Channel 3 network so does not automatically have the rights to rebroadcast all of ITV’s programming. UTV Ireland has a deal to show programmes made by ITV Studios, but this doesn’t cover all programmes shown by ITV. So, TV3 will continue to show some ITV programmes made by other production companies. ITV News from ITN and ITV Sport will not be available.